Here in Canada, even though it’s Spring, it will be quite a while before our winter blahs turn to green pastures again. It’s a great time of year to introduce a cheap and cheerful hanging system to brighten up your indoor space with plants! 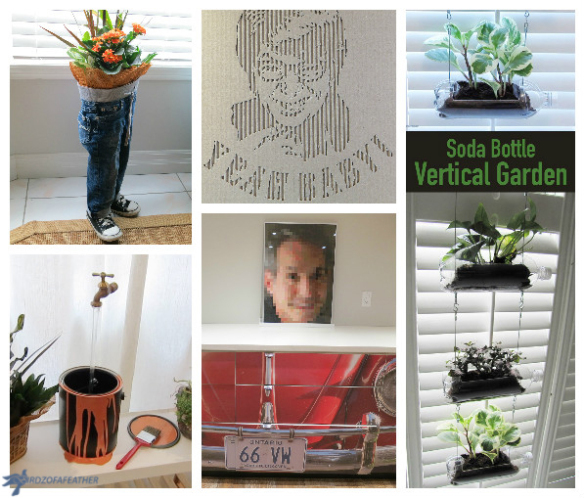 Using empty soda bottles for this project ties in perfectly to my philosophy of sustainable crafting – using what you have – to create a vertical garden. And the best part is that they are free! We’re not soda drinkers, but we found an entire box of empties in our neighbour’s blue bin on pick up day (nicely organized in a Pringles box!) and wisked them away to make our hanging garden. If you’re a visual learner and would rather skip the tutorial, watch the video at the end of our post (and subscribe to our YouTube Channel while you’re at it)! Let’s get planting! plants of course! Try herbs, succulents etc. I used a combination of succulents and Himalaya mix potted plants from Ikea. At $3.99 each, they’re a real bargain and I was grateful to be able to find them at this time of year! Although I used 5 bottles for my hanging garden, you could make as many as you like. When the weather gets better outdoors, they would make a great hanging screen on a massive scale too! To start, remove the label from the soda bottle. I used the label to cut out a rectangular piece measuring 5 1/4″ x 3″. I folded the label in half lengthwise and marked the centre of each side. I applied the label back onto the bottle through the middle of where it was glued. I found that with the combination of the glue residue and static cling, my particular label stuck really well. Mark the four corners with the black marker and measure out no less than 5/16″ from the centre on each side and place two more dots on the bottle. Remove the label. Apply two pieces of masking tape to a metal ruler and place on the bottle lining up two of the dots you marked with the black marker. The metal ruler should be placed on the outside of the line you’re going to cut – it will give you a cleaner line when using the wood burner. I use a wood burner to cut through the plastic (you could also cut the plastic with an X-acto knife instead). Make sure you’re using the tool in a well ventilated area; doing this step outdoors is ideal. Also ensure sure you have a heat-proof surface to leave it on while you work – and to be safe in case you forget to unplug it! I leave mine on stand with a metal tray beneath it. Heat up the wood burner with a pointy tip installed. Insert the tip starting at the spot you marked earlier and use the edge of the ruler to guide the wood burner along until you’ve reached the second dot at the opposite end. Do this as steadily and quickly as possible or you will distort the line if you leave it in a spot for too long and over-melt the plastic. Once you get the hang of it, you’ll be cutting through the plastic with ease. Remove the ruler then move it to the other side and cut through the bottle in the same manner. I used a scrap piece of metal strapping and bent it into a curve around the bottle. I used it in the same manner as the metal ruler to guide the wood burner and cut the plastic on the shorter end of the bottle. Once all 4 sides of the rectangle are cut, you can remove the inner piece of plastic, but don’t toss it (we’ll use it later). Take the tip of the wood burner a make a hole through the two dots you marked 5/16” out from the centre of the label. Only hold the tip for a second or you’ll make the hole too large; it only needs to be big enough to pass the aircraft cable through. The smaller the hole, the easier to seal it so water doesn’t escape. With the bottle facing right side up, insert the long loop turner through the hole straight down until it reaches the bottom of the bottle (you can even substitute a piece of spaghetti!). Mark the spot with the marker and do the same for the other side. Turn the bottle upside down and burn a small hole through the two spots you marked. Now we’re ready to construct the hanging system. Measure out two 12″ pieces of aircraft cable for each bottle and cut with wire snips. Insert the wire through one end of the metal ferrule, bend it into a loop and insert the same end into the other side of the ferrule. My loops were about 1/2″ in length. Place the ferrule into the swage tool and squeeze it tight to seal it on both ends of the metal. Thread a washer through the wire so it rests on the loop you just made. Insert the wire through the hole in the bottom of the bottle and through the top hole. Make a loop in the top of the wire using another ferrule as you did before and fasten it with the swage tool. Continue with the rest of the bottles until each one has two wires threaded through the holes with washers on the bottom to support the weight. If using outdoors, be sure to add a few more drainage holes in the bottom. For indoor settings, I would suggest adding a drop of waterproof clear caulking or epoxy putty to cover the bottom two holes (from the inside) so you don’t get water leaking through and dripping down the wires. The epoxy putty will be easier to work with because you can roll it into a tiny ball and squish it around the holes. If using caulk, to control it from oozing too much onto the wires, you can squeeze some out onto a plastic lid and use something like a coffee stirrer to apply it around the holes on the inside of the bottle. Make sure the wires are sitting tight against the bottom of the bottle (you could tape them as they dry if you have to) and let the caulk or epoxy dry according to the package directions before moving onto planting. Lay down some plastic on your table surface to catch the mess if doing this indoors! Gather up your plants and planting materials (soil, gravel, scoop). Be sure to purchase a soil suitable for your plants; here I’m using cactus soil for one of the succulents. Remember the plastic piece you saved from the middle of the bottle? I used it to confine the soil to the middle section of the bottle (so I could conserve on the amount of gravel I had to use), but you can choose not to use it if you prefer and fill the whole container out to the sides. Cut the plastic in half along the width and insert it into the bottle so the concave part surrounds the wire (facing inward). Put a layer of aquarium gravel in the bottom. This is optional, but it helps with drainage. (Note: if you’re doing this project for outdoors you can skip the gravel altogether and just add more holes in the bottom of each bottle for drainage). Add a layer of soil to give the roots something to grow into. Lift the plant out of its container and work loose most of the soil around the roots. Plant in the bottle and surround with more soil to secure. Don’t overfill the soil or it will wash over the edges when you water the plants. Continue planting the rest of the bottles until they’re all done. Now you’re ready to hang! I put all the finished bottles into a cardboard box and transferred them to the kitchen. I installed my hanging garden on the side of the sliding door that is non-working so we still have access to our backyard. To prepare, I hung two shower curtain rings over the curtain rod above my sliding glass doors. If you don’t have a curtain rod, you can substitute eye hooks and screw them into the wood trim the same width apart as the wire holding the bottle (approx. 5 3/4″). I created two new hanging wires (about 24″ long) and hung them from the curtain rings to start the garden at a suitable height. We used 3/4″ S-hooks as connectors. Hubs hung each bottle, one at a time, connecting them as he went with the S-hooks in between until he reached the bottom. It’s hard to get a good picture with the backlight from the window, so I tried closing the binds, but I can attest that the hanging garden looks stunning in the kitchen! You could change the configuration and adapt this idea for any window; just add a few more columns and stagger the plants. I hope you enjoyed another sustainable crafting project; if you did, please pin and share! If you haven’t already checked out the other Craft Rehab projects on our Youtube Channel, have a look at this duct tape portrait and see if you can guess who it is. Don’t forget to subscribe! A few more of our recent projects are shown below; just click the links. Craft Rehab category to explore more…. Get your craft mojo on at Birdz of a Feather. Subscribe if you don’t want to miss another unique idea! Follow right here (link in the footer) or via Bloglovin’ (link below) for more great crafty projects and home & garden DIYs. You can also follow us on Pinterest, Facebook, YouTube and Instagram. this is freaking cool, i have a question please would it still work if i turned every other bottle the opposite direction so the caps are staggered? Thanks Chris! Yes!!! I was going to do exactly what you suggested but my husband decided to hang them all the same way. The possibilities are limitless 🙂 If you make one, send me a picture; I’d love to see it! I was thinking that surely people don’t have the things you used to make this just lying around their homes. The bottles, yeah, but the wire, the futiles, and such, no. Don’t get me wong, I LOVE this idea, but I was thinking about something more rustic than the wire, perhaps twine? I don’t know, but you’ve got me thinking, that’s for sure! Thank you ever so much for the ideas! Friendly tip: It’s label, not lable. I like this creative, inexpensive idea, and you have explained it well. Clever! Could be used to grow fresh herbs in-house all year long. Thanks! Yes, that would be a great use for it! Thanks Cynthia. We don’t drink soda so we had to scavenge too – lol. I tried to subscribe but it keeps flashing “error” and asks to please try again. I’m sorry you’re having problems Veronica. Are you subscribing via e-mail? The only thing I can think of is to try another browser and see if that helps.